A short time ago a friend offered to let me go through her recipe box. It was both an illuminating look at my friend through the foods and recipes she thought enough of to keep over the years and also a perfect opportunity to find her favorites and prepare her a very special birthday dinner. 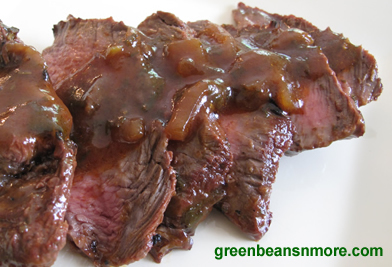 The crowning glory was this perfectly grilled flavorful and tender flat iron steak. One of the recipes in my friends recipe box was for a barbecued pot roast marinade. I made the marinade for flat iron steaks that I grilled. The meat was made both flavorful and tender by a full 24+ hour marinade. I basted the meat with some of the marinade while it grilled and cooked the remaining marinade, using it as a side sauce. This marinade would be perfect on any cut of beef, chuck roast, brisket, tri tip, flat iron, filet mignon, London broil, rib eye, t bone or sirloin. Combine above ingredients in a sauce pan and simmer for 20 minutes. Cool. Pour over meat and let marinate for at least 24 hours. This recipe makes a very generous amount of marinade.